In our rush from the church, have we begun using entertainment as religion to answer the questions fundamental to human thriving? Our culture has almost entirely insulated us from the reality of death. Most of us are awkward with the topic in conversation and go to great lengths to avoid the appearance of nearing death with a plethora of products, services and surgeries designed to cheat aging at any coast. Our post-modern avoidant/fascination with death struck me last night at our local cineplex. The new release lists are heavy with vampires, zombies and time travel…except for the ones about super heroes with death-defying powers. When did death-avoidance become the central theme of our entertainment? Although we may abandon organized religion, it appears that we do so at our own existential peril. In our rush from the church, it seems we have begun using entertainment as religion to answer the questions fundamental to human thriving. Last night’s trip to the theater was instructive. The opening line to the movie The Book Thief is “Everybody is going to die someday.” The closing line of the last preview before the movie started was from The Winter Tail: “Maybe it is possible to love someone so much that they cannot die.” Interestingly, the Christian message is precisely that there is a love so strong it will overcome death. But instead of considering that message, most of us will avoid thinking about death until we stare it in the face – literally looking down at the remains of someone we loved lying in a casket. Our obsession with death becomes even more curious when viewed in light of our near total buffering from it. In previous generations death came earlier, more often, and closer to home-most likely even in the home. Today we have longer life expectancies, become infirm in care facilities, and enter hospitals when illness becomes terminal. Today when we take our last breath it is usually in an institution rather than in the places of our lives. (This has been covered in the press recently (NPR) and was picked up on the Episcopal Cafe.) Add to these layers of insulation, the entertainment industry. Big entertainment includes in it’s notoriously unreliable curriculum the lesson that people don’t actually die at all. They are “offed” (often quite creatively) only to appear next week on another network, perhaps even in the same time slot. The media is merely a barometer of our desires – It packages and sells us what market research tells them we want. Having discovered our discomfort with our own mortality, it sells our anxieties back to us in the form of a seemingly endless array of zombies and vampires, with their promise of a life-of-sorts. Perhaps, though, the clearest barometer of our post-modern denial of death is found in the new Tumblr site, “selfies at funerals“. If we cannot cheat death, at least we can laugh at other’s deaths. Turn up the music, dude! 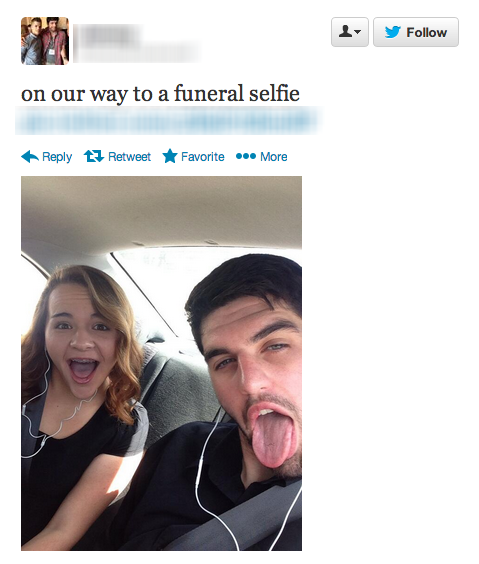 Perhaps the epitome of our post-modern denial of death is found in the new Tumblr site, Selfies at Funerals...Turn up the music, dude! All of this, of course, affects the church. Many Christians now have an “It’s a Wonderful Life” theology of the afterlife more akin to ancient Greek (or perhaps LDS) beliefs than orthodox Christianity – this is the popular view we “pass on” to become angels trying to win our wings by aiding the frustrated left on earth. Contributing to this fuzzy theology is the demise of the traditional funeral. 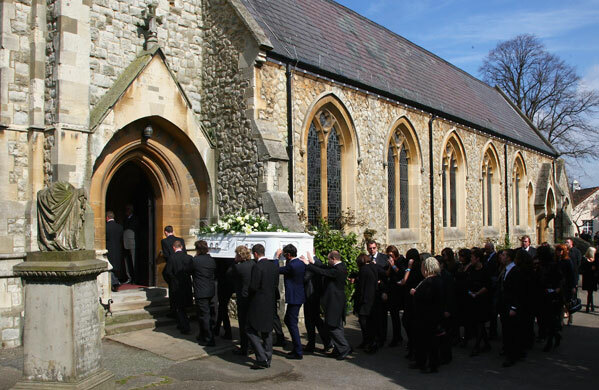 You may never have been to an actual funeral, but you have surely been to a memorial service. A memorial is, of course, about looking backwards – of “memories.” The general liturgy of a memorial is to sing a few of the deceased’s favorite songs and, to continue our It’s a Wonderful Life metaphor, share our remembrances of Uncle Billy. Occasionally a few too many remembrances, and for too long…glossing over flaws and overstating things a bit on behalf of someone whose life might have actually left a lot to be desired. To be realistic, returning again to It’s a Wonderful Life, although Uncle Billy’s absent-mindedness was cute, it caused the family a great deal of trouble. The pastor then closes the memorial with a short message that makes some reference to Jesus’ as accounting for the deceased’s goodness and gently asking those present to consider a relationship with God in order to join Billy in his eternal home. As heartwarming and well-intended as it is, the memorial is all about looking backwards. A funeral is all about looking forward. It is about promises and hope bought vicariously. It is about real and eternal life, new bodies, and paradise found, purchased at another’s initiation and another’s expense. Here is where I may get into trouble with you: It may feel as if I am treading on the toes of those of us who planned the final services for our parents or wife or brother or Uncle Billy. I should say that, as a pastor, I have done more than a few memorial services myself. We sent my mother on her eternal way with a memorial service. After more theological reflection I can only say that I wish I knew then what I know now. I was the victim of a lack of theology of death and the afterlife. And, as a result, those under my leadership were limited by my lack of understanding. I now see the memorial as a far cry from a prayer book funeral. Interestingly, while this end of life conversation was going on, three clergy in the Episcopal Church: Nicholas Knisely, Bishop of Rhode Island, Bryan Owen, Rector of St. Luke’s Baton Rouge (who blogs as Creedal Christian), and myself have been working on a question and answer on funeral practices as a customizable parish resource to give people a brief glimpse into the purpose and power of a proper funeral service. It will be available as text for websites or as a customizable flier. I will put up the text that we have worked out as a post in the next several days. We offer this, not as a condemnation of what anyone has done, but as a resource to help us have a broader perspective on life, death, and the afterlife. The hope is that this would be a helpful planning resource for a time when you need it. The traditional funeral has the perspective of twenty centuries of Christian reflection that both blesses and relieves us of the absurdity of seeking for answers to our deepest longings in zombies and vampires. It offers a more hopeful hope. Not just for Uncle Billy, but for us as well.